Airports Vanuatu Limited with approval from the Council of Chiefs of Maewo and Landowners of Malolo Airfield should consider agreeing to harden the surface of the runway to stop planes from skidding on the wet grass. In the latest incident last Friday morning, whether the pilot knew that the right side just before the end of the airstrip has no ditch or stones or tree trunks except bush vines and a garden of island cabbage is not clear, but I was sitting on the right of the cockpit as the Air Taxi plane touched down in the rain and skidded on the wet, slippery grass towards the end of the airstrip without stopping. I glanced at the pilot with four stripes on her uniform as she calmly steered her plane into the clearing on the right and stopped the engines just as the propellers start chopping off the leaves of island cabbage. It was smooth. The passengers, four strong young men from the Department of Fisheries and Aquaculture (and myself) led by Manager of Research and Aquaculture, Sompert Gereva, volunteered to push the plane back to on to the runway. The pilot thanked her passengers and entered her aircraft just as a Hilux truck drove down to the end of the airfield. “We were waiting at the terminal but we decided to come down to check on you guys when the plane failed to taxi back to the terminal,” the driver of the truck said with a smile. He said just as well the pilot turned right because there is a ditch on the left side of the runway. He agreed to put a rope on his vehicle in case it comes in handy in the future. 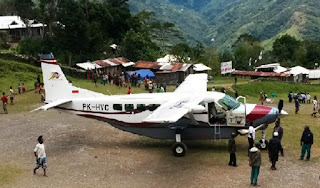 “Whoever thought we would end up pushing a plane instead of a truck while we are up here on Maewo,” the passengers mused. One by one they agreed it was their first time to push a plane. The passengers waited at the terminal building until the pilot was safe in the air before they continued on the first leg of their mission to the Naone Elbow Bridge. The river which is sometimes referred to by new comers to Maewo as ‘Wai Lawua’ or Big Water, also boasts a number of waterfalls including most likely the most spectacular waterfall on Maewo. The aquaculture specialists were on Maewo to join the Minister of Agriculture, Livestock, Forests, Fisheries and Biosecurity, Matai Seremaiah and his Acting Director General, Benjamin Shing, at the launch the first prawn farm to be hatched outside Port Vila at None Village.